Begin your journey with a drive into St. George’s Harbor, one of the Caribbean’s most picturesque harbors. Here you’ll be surrounded by a historical fort, an array of colorful fishing boats and luxury yachts. Before taking in the spectacular views of Grenada’s west coast and the Caribbean Sea, you’ll journey through the bustling spice market, where you’ll be enthralled with the aroma of freshly packaged spices, various tropical fruit and locally produced souvenirs. 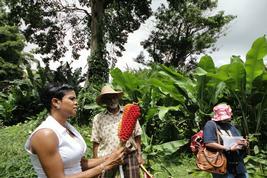 Passing the national stadium which is named after Grenada’s first Olympic medalist Kirani James, your next stop takes you to the Gouyave Nutmeg Station, where you will get a full insight into the processing of nutmeg. Then it’s time to step back in time to the Diamond Chocolate Factory and Cocoa Estate, where traditional farming methods still produce some of the world’s best chocolate. 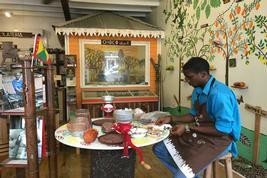 With Grenada fast becoming the chocolate island of the Caribbean, you’ll learn about the island’s organic award winning chocolate and enjoy uniquely flavored cocoa beans with flavor profiles such as citrus, vanilla, nutmeg and ginger. Lastly, the return ride takes you to the cascading Concord Falls, where you can immerse yourself in Grenada’s natural beauty and take a dip in a natural plunge pool.